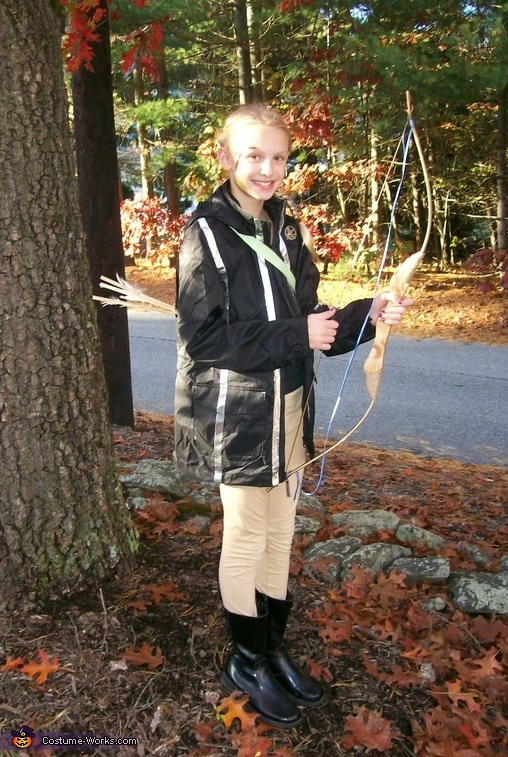 Katarina as Katniss Everdeen in the Hunger Games. Katarina is dressed as Katniss Everdeen from the Hunger Games. she is wearing Katniss's costume from the 74th Hunger Games. We make the jacket using a black wind breaker from Lands End, which we decorated with reflective tape to look like the Hunger Games. She wore tan pants tucked into black boots. She has the Mocking Jay pin no her jacket. Her face is painted with a scratch and Tracker Jack sting. Kat has a wooden bow and arrow set (purchased on ebay)...hand made.